It's the all-new, good for you, and completely fun, EAT THIS, NOT THAT! THE GAME! Think you can spot the safe food from the gut bomb? EAT THIS, NOT THAT! 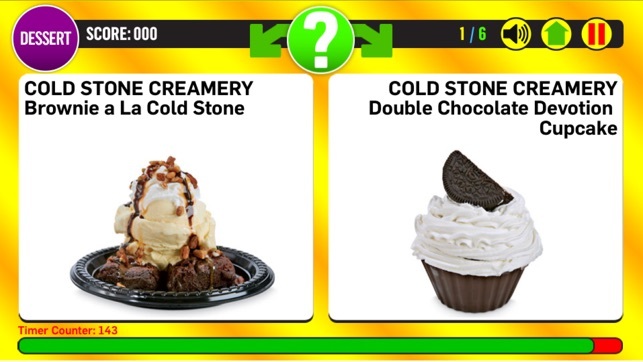 THE GAME challenges your armchair nutritionist skills with face-offs of food from all the famous fast-food joints and grocery aisles. 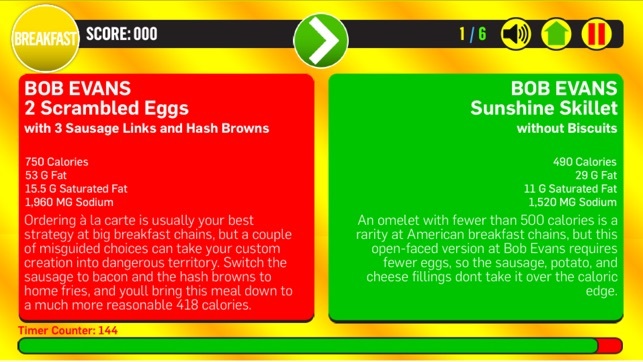 In this fun, quippy and incredibly informative app, you'll tap through round after round of food items, adding to your score as you tap the healthier item. 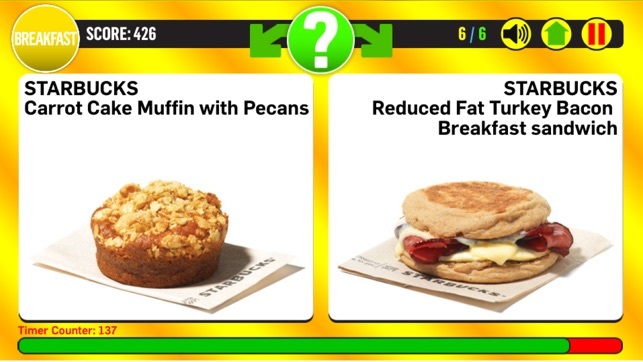 As the timer runs, more and more nutritional info appears to inform your choice. But the quicker you are, the more points you earn. After each tap, the correct "Eat this" and Not That" labels are revealed, along with the fascintating, devastating explanations of why you should—or shouldn't. 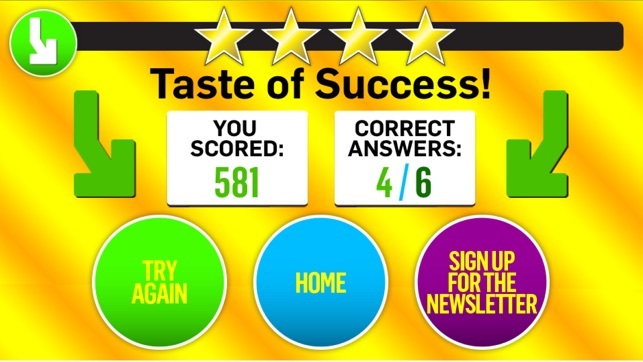 Rack up your score and learn what habits you need to change. Some of the info is incredibly surprising! Optional Hints: Feeling lucky? Play the game without hints, and see if you can guess by image and name alone. Lots of Free Gameplay: At the end of each round, retry that category to improve your score, or try one of the other categories. Come back to the app often—we're adding new swaps all the time. 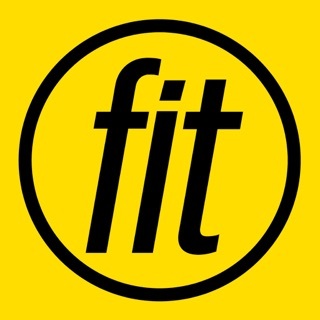 *Certain activities on this app may be licensed under one or more claims of U.S. Patent No. 6,585,516. General updates and advertising improvements. It's not helpful, however it is fun and can cure bordem, also if you have the book next to you, you can look up most of the answers. This could be a good App! 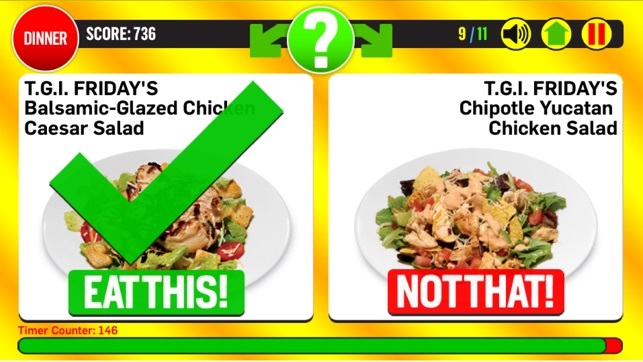 The game presents you with two pictures of restaurant meals, the goal is to pick the healthier one. However, it does not tell you what is in the picture and on my iPhone I couldn't figure out what I was looking at. It would be great if they had a verbal description of each meal. 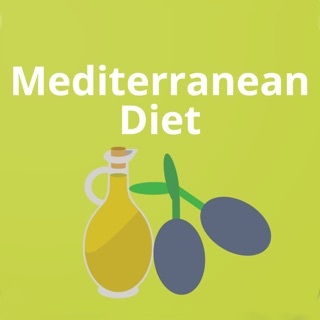 The app called [EAT SMART: from nutrition scanner to food swap] is far better than this one. 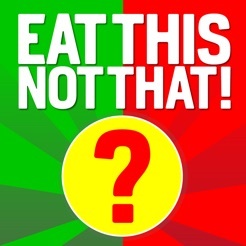 You can choose from variety of suggesting foods [EAT THIS] based on the food that you previously selected [NOT THAT].